A Mei Mei for Us! Easter Sunday was beautiful but windy. We were forced indoors for our pictures. I always like to put the Easter baskets out the night before and take a picture before the kids ravage them the next morning! If the boys' baskets look a little lacking in comparison it is only because they had a gift card from Game St*p in them and that doesn't take up a lot of space. BTW~trying to get pictures of four kids and make it to church on time is almost impossible. This is especially difficult if two of them are teenage boys who don't exactly like to have their pictures taken. 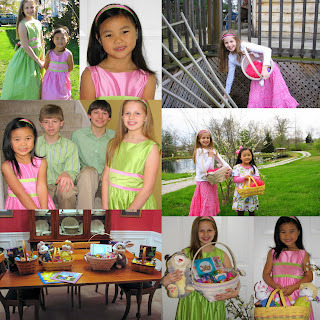 There are a couple of pictures from an aftenoon Easter egg hunt at the Grandparent's house. James was in charge of the camera and he had subjects that were too quick for him. I think his Mom may have gotten some better shots though. I will have to have her e-mail me some. We took the kids on a hike to Natural Bridge one day during spring break. Claire enjoyed taking pictures with her V-T*ch camera, but she isn't much into the hiking scene. Not enough shopping for her taste! She didn't like the mud, the heights, or much anything about it. She is also somewhat of a bathroom snob so that also created a problem for her. She says she is never going back there again! Too funny. Claire is more of a beach girl when it comes to the great outdoors unless you count Disney World as the great outdoors! We had two events we attended for CNY to help celebrate the Year of the Ox. The first event our whole family went to a Chinese dance and then we went with a large group of families to eat at a Chinese restaurant. Claire and Laura were able to see several of their friends including Oakley, and Lillie, who they had their picture made with. It was a lot of fun seeing all of Claire's "China friends". The second event we attended was with another group of "China friends" and a lovely lady from China demonstrated some Chinese dances for us and then she allowed the children to all join her on stage as she led them through the steps of the dances. The girls loved this. She even gave them each something to wear for the dance. Laura had a vest and Claire had a headband. Two years ago today at 8:00 am, the most amazing little girl was placed in our arms. She didn't cry at all, but she she studied us very intently. Her SWI director kept telling her we were her Mama and Baba and she would look at the correct one each time the director said that. We adopted Ling Ling the same day. We were told her name translated to mean "a unique clever girl" and she certainly is that. We called her Ling Ling for several days and added Claire to the end some. Eventually we called her Ling Ling Claire and when she was ready, just Claire. 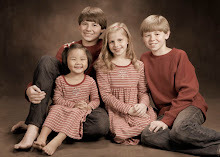 We decided to keep Ling as part of her name and she is now known as Claire Reagan Ling. I can't describe to you adequately how much this wonderful child has enriched our lives. She makes us all smile and laugh every day. She is a constant source of joy and she has blessed us beyond measure. She is God's gift for our family. The pictures above are from the first moments we got her and the one with the ball is after we got back in our hotel room. They were all taken on our Gotcha Day. Here is our very short Gotcha Day video. The picture below is from today. Two years later. Claire is 4 years old. Married 17 years and mother to 4. 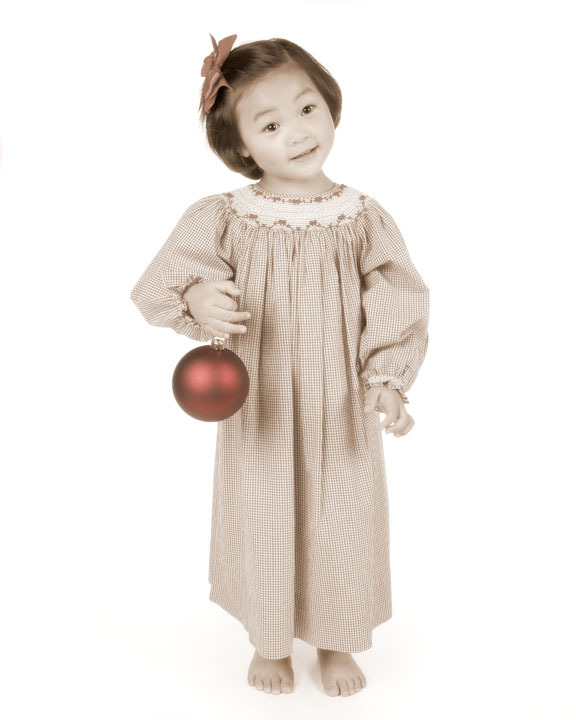 Our latest is from Guizhou, China and she was adopted in December 2006.